Today, a wide variety of designers are interested in PCB services: pro engineers, makers, and even students. Business is booming. Eurocircuit's Managing Partner Dirk Stans talks about his company's high-quality PCB services, its close relationship with Elektor, and the international PCB market. 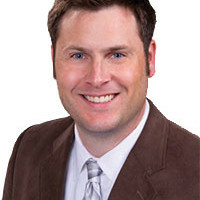 C. J. Abate: You have a university degree in engineering. But you are also an entrepreneur and accomplished marketer. What led you to the PCB industry? 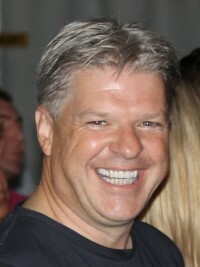 Dirk Stans: Working for DISC, which later became Barco Graphics, I was active in the sales department with responsibility for all existing European customers for their Electronic Tooling Systems. Barco Graphics, who are today known as UCAMCO, developed and manufactured Laser Plotters and Graphic Workstations (CAM) for the PCB industry. This is where I gained my knowledge of PCB manufacturing. C. J.: Describe the European PCB market in 1990s? Why did you launch Eurocircuits over 20 years ago? What sort of customers were you servicing back then? Dirk: Early 1990s were interesting times. The Berlin Wall just fell (3-10-1989). PC, Windows, and the Internet became the new standards. It felt like all known values were changing and anything was possible. Luc Smets, my business partner, and I were still young back then. At the same time, the PCB manufacturing industry was very traditional, relying on large customers demanding volume production. Europe was making about 44% of the world PCB volume and anyone who needed prototypes or small series were treated as the fifth wheel on the wagon. Hence, we spotted our market segment — prototypes and small series with short delivery terms. However, fulfilling this ever-growing demand was the big challenge as Western European companies had no interest in supplying such orders. Since the Wall had just fell, Eastern European companies were searching for work; their single source for jobs, the government, dried up. In need and very willing, they had the flexibility we were looking for. Able to fulfill these small jobs with short lead times, they differentiated themselves from others and so a WIN-WIN situation was born. PCB companies in the East begging for work and engineers in the West begging to be served. Our added value was bringing them together. C. J.: Things sure have changed since 1990s. Today, a wide variety of designers are interested in PCB services: pro engineers, makers, and even students. Describe Eurocircuits today. What’s your business model? Who are you customers? Dirk: The market today is most definitely different from 25 years ago. Almost all PCB volume production has left Europe, and today Europe produces hardly 5% of the world’s volume. Only a fraction of the PCB manufacturers from the early 1990s are still active today. Those that are now making small and medium volume production, which are very often high-density boards. Our market today is still the electronic design engineers. 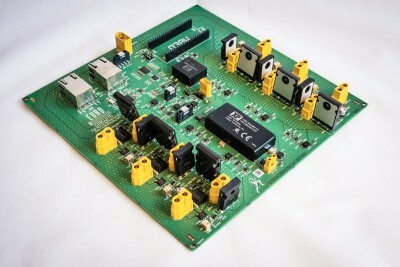 These drive the market of PCB prototypes and small series. The challenge today is to offer these heavily burdened designers the necessary customer service to make their job bearable. 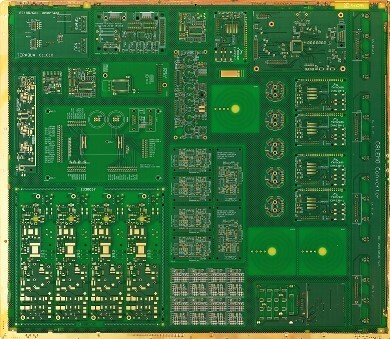 The demand for PCB prototypes and small series has also grown immensely. Today we have over 12,000 active customers with over 20,000 users, managing this requires a whole new set of tools and services compared to 20 years ago. We processed over 107,000 different PCB orders in 2017, over 97% came via our online order system, and all of them were processed through our e-business platform. This ensures a lean and cost-friendly business flow, capable to handle a large volume of orders, invoicing and payment tracking (Figure 1). demonstrating the principle of our order pooling. C. J.: Tell us about your team. How many locations? How many employees? Dirk: The Eurocircuits team is very international. The headquarters are in Mechelen, Belgium (Figure 2). 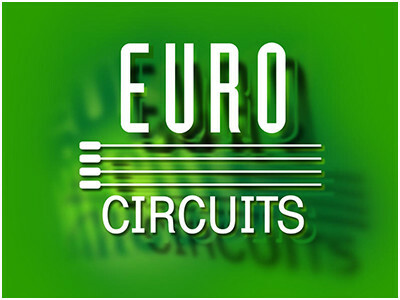 Our main manufacturing site is Eurocircuits Kft in Eger, Hungary, flanked with two smaller production plants, Eurocircuits Aachen GmbH in Baesweiler, Germany and Eurocircuits India Ltd in Gandhinagar, India. The India location also houses our CAM preparation department, PCB Planet. Additionally, in Europe, we have sales locations in: Belgium, France, Germany, Italy, UK, and Hungary. We have our own team of software developers — two in Belgium, two in Hungary, and some 20 in India — developing our group software from shop floor tools to our e-business frame and websites. The Eurocircuits Group totals around 400 employees. Whilst the internal language of the company is English, we have a wonderful multilingual workforce that allows us to communicate with our customers in their preferred language. 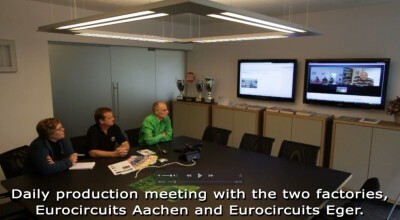 Figure 2: Daily online production meeting at the Eurocircuits HQ. C. J.: In addition to high-quality PCBs and reasonable prices, you offer customers a nice range of free online tools, including design optimization tools and a PCB Checker. At which point in your company’s history did you realize the need to offer such tools, and when did you start offering them? Dirk: In the first decade of the new millennium, we bumped on the boundaries of our team’s capacity, dealing with individual guidance for orders that could not go into production mainly due to issues with the data. ◦The quality of data received was not very high, and we suffered from over 25% of show stoppers caused by data issues. Something needed to be done. Educating the market was one possibility, but this is very hard to do and an ongoing long-term project. Building a suite of tools around the designer to help them identify all the issues before they order and thus also to avoid them was our goal. ◦We launched the first version of PCB Visualizer in the first half of 2012. Within two years, the PCB Visualizer brought the level of data show stoppers down from over 25% to under 3%. Today, we process 500 orders/day. The PCB Visualizer has helped reduced the show stoppers from 125 to just 15. As a result, our team is able to spend more time helping customers with real problems (Figure 3). Figure 3: PCB Checker in the PCB services filters out all Design Rule Check issues. At the same, time the design engineers have saved time and money enjoying the convenience of knowing upfront their design is “Right First Time for Manufacturing” (Figure 4). The PCB Visualizer helps improve their knowledge of DFM related issues in a visual way. We are educating the market step by step. WIN-WIN again. non-Gerber data like Soldermask Colour, etc. C. J.: You provide more than PCB services. Tell us about your assembly services. Dirk: Component packages are getting smaller all the time, and hardware engineers are over stretched. They lack the time and even the resources to assemble their prototypes as they did in the past. Traditional Assembly companies choose to deal with a limited number of customers and form a close relationship for their larger series. Assembly data is more complex to handle compared to PCB data which is driving the level of show stopping issues up to almost 100% of all orders. Assembly of PCBs requires intense and therefore costly job preparation and is the main factor why Prototype and Small Series Assembly service hardly exists in Europe. To tackle the data problem from the root up, we extended our well-known PCB Visualizer to PCB Assembly Visualizer, allowing the design engineers to visualise their PCB including all components before issuing any order. A full DRC and DFM can now be performed on the assembled PCB before ordering. This helps drive down the cost of preparation, removes show stoppers, and creates a viable environment for our business of assembling Prototypes and Small Series. If Eurocircuits manufactures the PCB, we may also accept the assembly order. Once again, the design engineer enjoys the comfort of knowing his order will process without errors. They also increase their knowledge of manufacturing at the same time. WIN-WIN again. 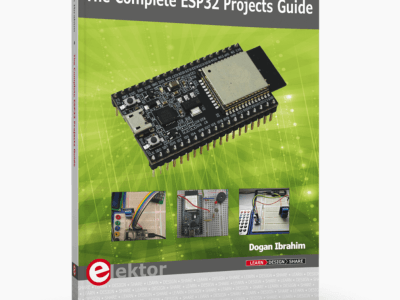 C. J.: Anyone who visits your site (www.eurocircuits.com) will find excellent educational resources, such as short “tip and tricks” articles and videos on key topics like optimum PCB design follow. You also created an amazing video, “How to Make a 4-Layer PCB” (http://bit.ly/4-Layer-PCB), which I recommend to anyone interested in electronics and PCB design. You put a lot of work into your content. How important is it for your team to educate your customers? Dirk: Crucial. I know we are not the Coca-Cola company or Walt Disney and thus we have a slow and limited impact on the market. We nevertheless feel it is our duty to educate the design engineering market in electronic manufacturing. The world of design (CAD) and the world of manufacturing (CAM) cannot exist without each other. It is imperative that we all contribute to make the knowledge gap between these worlds as small as possible. 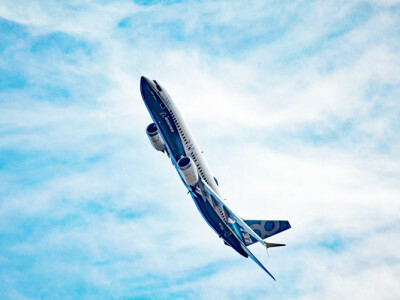 Design for manufacture can only work if the designer knows what is possible in production. Design for reliability can only be successful if the designer knows the key factors that influence the reliability of his design, often to be found in the manufacturing environment, but always the result of choices made by the designer. The same can be said for Design for Test and Design for Logistics, etc. In short, Design for Xellence. It all starts at the source, the designer; therefore, we should put as much effort in educating this source as possible. Today’s communication is more image than text-oriented — hence, our choice to make videos. We have started our own online TV channel, eurocircuits.tv, and have invested in our own TV studio and studio equipment. 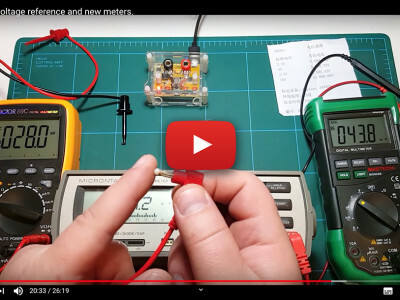 We are all geared up to deliver VLOGs on all interesting topics in our European Industrial Electronics market and therefore to create all the educational and instruction videos needed. independent walking for people with a spinal cord injury. C. J.: Your website includes information about several interesting customer applications and student projects. Can you describe a recent customer application that really caught your attention? Dirk: For Eurocircuits, educating the design engineer starts with the students who we love dearly. We invest a lot in student projects and guide them as much as possible. They are, after all, our future. It would break my heart if they thought I favoured one over another, but one student team really touched my soul and that is the Project March Team of the Technical University of Delft in Holland. 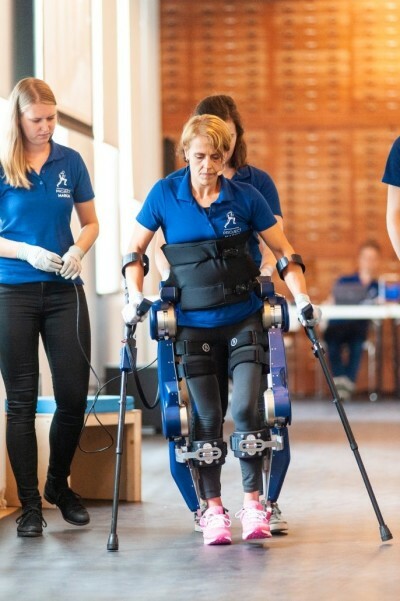 They are building an exoskeleton (Figure 5 and Figure 6) and improving it year on year with the final goal to make people with a spinal cord injury walk independently. Wow, what an achievement, and what a social impact this could deliver. We support some 50 teams all over Europe, but the March team really touched my string. Figure 6: Power distribution board for the exoskeleton. C. J.: You have a nice history with Elektor. Since 2009, Eurocircuits has teamed with Elektor to offer the Elektor PCB Service (www.elektorpcbservice.com). Thousands of users have registered since its inception. Tell new Elektor members and readers what they can expect from the service and what separates it from other options they can find online. Dirk: Eurocircuits have a close relationship with Elektor since the 1990s. The Elektor PCB Service is indeed a strong tool for Elektor members. It holds all the services that Eurocircuits can offer, including chat and all other types of communication directly with the Eurocircuits customer service team. 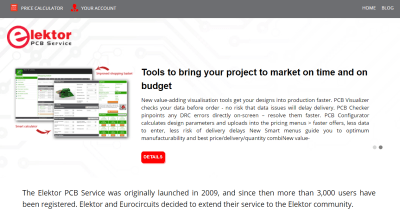 All services and quality guarantees of Eurocircuits as a European market-leading company are represented in the elektorpcbservices.com (Figure 7). It is therefore a wise choice as PCBA service. no tooling charges or minimum order value, and more. C. J.: Let’s wrap up with a personal question. Do you design electronic devices in your free time? If so, what have you designer recently? Perhaps you are working on something now? Dirk: This might come as a surprise but although I’m an electronics engineer, I haven’t touched electronic design since I left the university. My path was always in sales and marketing and entrepreneurial activities leading me away from creating electronics. Nevertheless, my interest has stayed in electronics, and I do really appreciate every single design that is being created. I believe this is my personal motivation to see electronic designers as the prime Eurocircuits customers. Eurocircuits, Customer Applications and Student Projects, www.eurocircuits.com/customer-applications-student-projects/. Eurocircuits, “Looking Back at 2017,” www.eurocircuits.com/blog/looking-back-at-2017/. Eurocircuits, “Looking Forward into 2018!,” www.eurocircuits.com/blog/looking-forward-into-2018/. Eurocircuits, “Right First Time with PCBA Visualizer,” Press Release, 2018, www.eurocircuits.com/blog/press-release-september-2018-right-first-time-with-pcba-visualizer/. Eurocircuits, “The Optimum PCB Design Flow – Right First Time,” www.eurocircuits.com/pcb-design-flow-optimized-and-pcb-cam-in-the-eccloud/. D. Stans, “Eurocircuits – What About Marketing?,” www.eurocircuits.com/blog/eurocircuits-what-about-marketing/. D. Stans, “The History of Order Pooling?,” Eurocircuits, www.eurocircuits.com/blog/the-history-of-order-pooling/. D. Stans, “The Strategy of Eurocircuits – 20 Years of Evolution,” Eurocircuits, www.eurocircuits.com/blog/the-strategy-of-eurocircuits-20-years-of-evolution/. 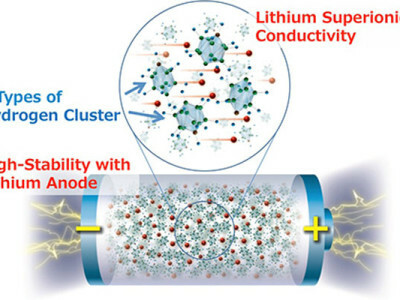 This article will also appear in the November 2018 edition of Elektor Industry magazine. Summer Contest: Who is your favourite PCB order pooler?